Fast growing and most pendulous dissectum. Leaves have tones of green and orange in early spring, turning purple and then green in the summer. 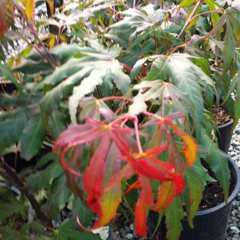 In late summer puts on red new growth which then turns bright orange in fall. Compact, rounded tree, ideal for containers. Becoming plum-red in the summer. Fall colour is a vivid sunset-red. Sun or part shade with moist WD soil. Upright, rounded, hardy, durable, large leaves. Bronzy, rich green, glowing fiery red.